The Face of Intrigue: A Conversation with Tabitha Whitley | Jill Thayer, Ph.D.
Tabitha Whitley Interview by Jill Thayer, Ph.D. Growing up in New York City, Tabitha Whitley explores the cultural narratives of identity construction and interconnection. Her aesthetic sensibilities bring a confluence of fashion, science, and anthropology that become compositional considerations in her work. 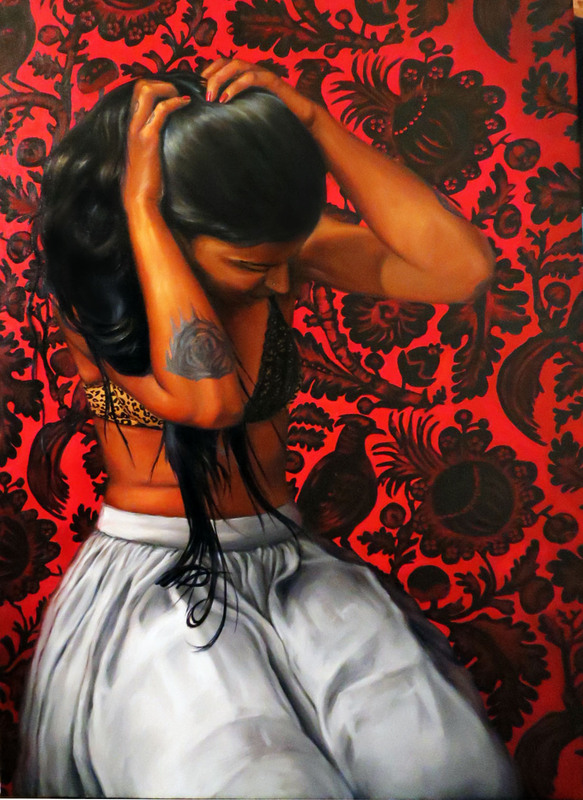 Whitley’s subject matter beckons the viewer through an intrigue of organically infused settings in pattern and adornment that are quintessential to her portraits. Tabitha Whitley was born in Brooklyn, New York in 1987. Her media includes oil, pastel, and ink. She received a Bachelor of Fine Arts from The Fashion institute of Technology in 2009 and a Master of Fine Arts from New York Academy of Art in 2011. 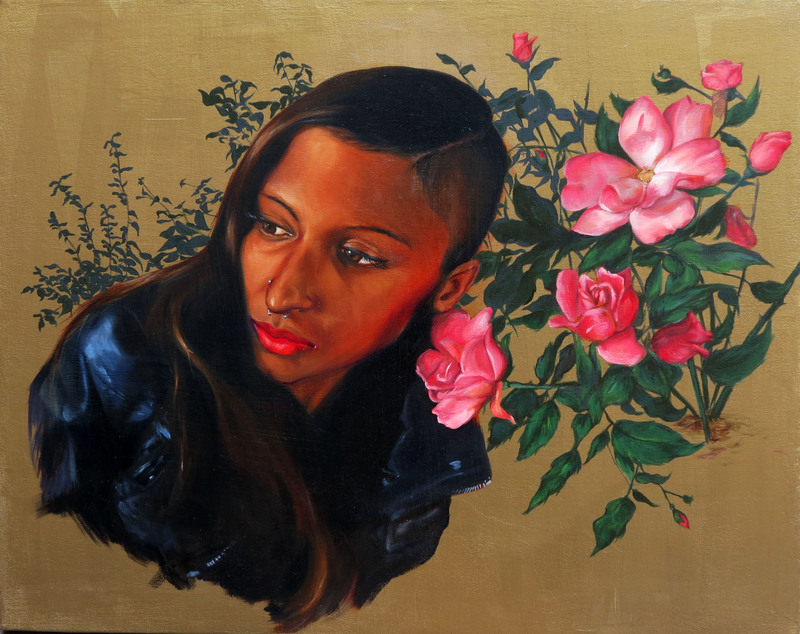 Her work is shown in regional galleries including a 2014 solo show at GreenPoint Gallery and a group show at Mark Miller Gallery. She currently lives and works in Bushwick, Brooklyn. I interviewed the artist from her studio in Brooklyn, New York as she shared her influences and the context of her methodologies. 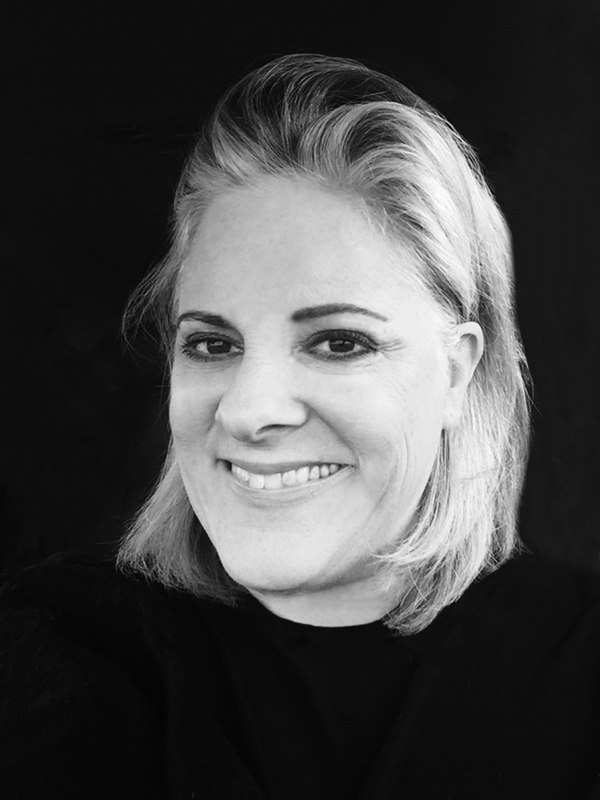 Jill Thayer: Did your family influence your career as an artist? Tabitha Whitley: Yes, absolutely. When my grandfather Thaddeus was alive, he and my aunt Katharine ran their own Architecture firm called, “Whitley Design Associates.” So when the family noticed me taking an early interest in art they all encouraged and supported me. JT: I understand that your family has lived in New York for over a century and you recently researched your ancestry. Can you share your findings? TW: Through public records, I found a census form showing my great-great-grandfather living in New York City with his mother and grandmother in 1915, but after that I hit a wall and couldn’t find any more information. I decided to take things a step further and took the Ancestry.com DNA test. With that I found out that I am 68% African, 30% European, and 2% Asian. My African roots can be traced back to The Democratic Republic of the Congo, Cameroon, The Ivory Coast, Ghana, Togo and Benin with my European roots leading back to England and Ireland. JT: Has this history informed your work? TW: Being African American, its life-changing to go from having a vague association with a huge diverse continent like Africa to now having the name of a country and a people with history to explore that goes back thousands of years instead of a few hundred. I plan on exploring and integrating the art and iconography from my African and European roots in my next body of work. 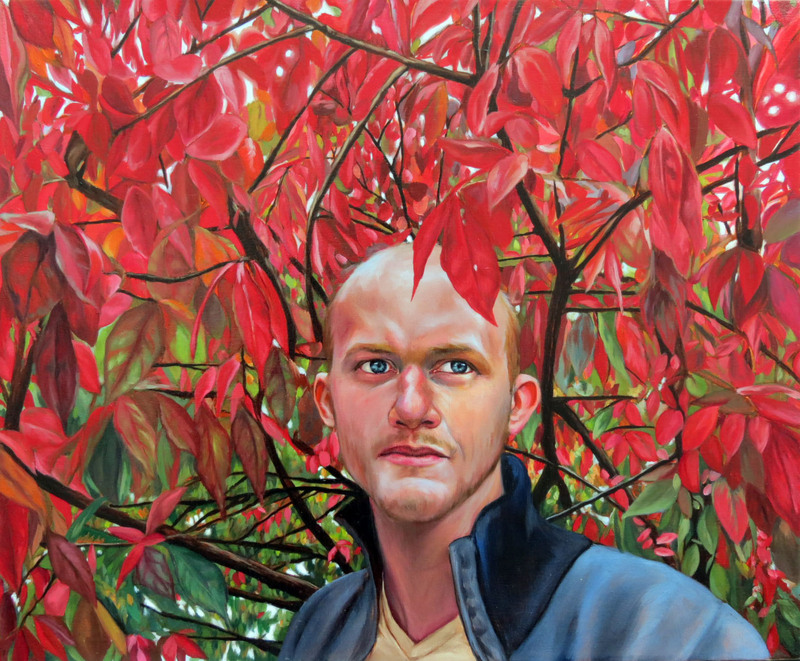 JT: I see a confluence of figurative and botanical elements in your portraiture. Is there a symbolism in this integration of plant and human life? 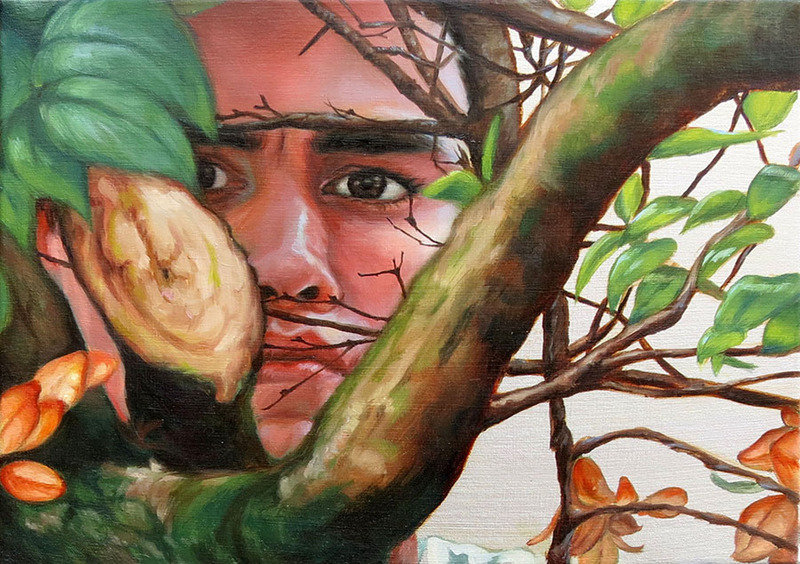 TW: Yes, I put the foliage in my paintings in the foreground with the figure rather than the background because I am very inspired by the interconnectedness of living things on this planet. I love the idea that if you trace our genetics back far enough you can find that we humans share a common ancestor not just with animals, but with trees as well. I treat the plant life as another character in my narrative rather than a background prop to show that we’re far more closely related than most people realize. JT: Your work imparts a fusion of Western and Non-Western cultures in references that signify your compositional appropriations. How did your use of fabric, patterns, and figure ornamentation evolve? TW: I enjoy the repetition of making patterns like the wallpaper in “The Red One,” or the over 500 leaves in “Carpenter.” I believe painting something because you enjoy doing it is best reason to. JT: What was your takeaway from graduate work at New York Academy of Art? TW: I chose the Academy because I wanted to learn the classical painting, drawing and sculpture techniques of the old masters. But the Academy also taught me how the take those tools and use them to express myself in a way that is relevant to the contemporary art world, and for that I am eternally grateful. JT: Your portraiture is reminiscent of Alice Neel whose character studies are both emotionally and psychologically engaging. Tell me about your subjects. TW: I take a lot of inspiration from film and I want my paintings to feel like a moment caught in time. It’s my hope that people see my work, empathize with my subjects, and want to know more about what’s happening to them in that particular piece. JT: What artists or genres do you connect with? TW: I really enjoy work by Jenny Saville, Odd Nerdrum, Kent Williams, and Phil Hale to name a few. They’re all contemporary artists who incorporate the human figure in their work in different ways. JT: What words best describe you as an artist? TW: “Interconnectedness,” “Nostalgia,” “Heritage,” “Lineage,” and “Sparkle.” I think these words describe my work best, but if I where to describe myself as an artist I would say that I’m meticulous, process oriented, romantic, dramatic and indulgent. TW: This was the painting that inspired me to start incorporating nature and foliage into my compositions. I loved painting Genie because she is a lot like the roses in that she has a bit of a hard edge with her leather jacket, piercings, and shaven head, but there is a delicateness in her gaze, much like a soft rose and its thorns. TW: I think that this piece was less about content and more about process and just the joy of painting different textures. From the wallpaper to the tattoo to the hair, this was a piece where I just played. TW: The branches in this painting are what really inspired me, the way they turn and wrap around the figure makes me think of sacred geometry and how math is the language of the universe. 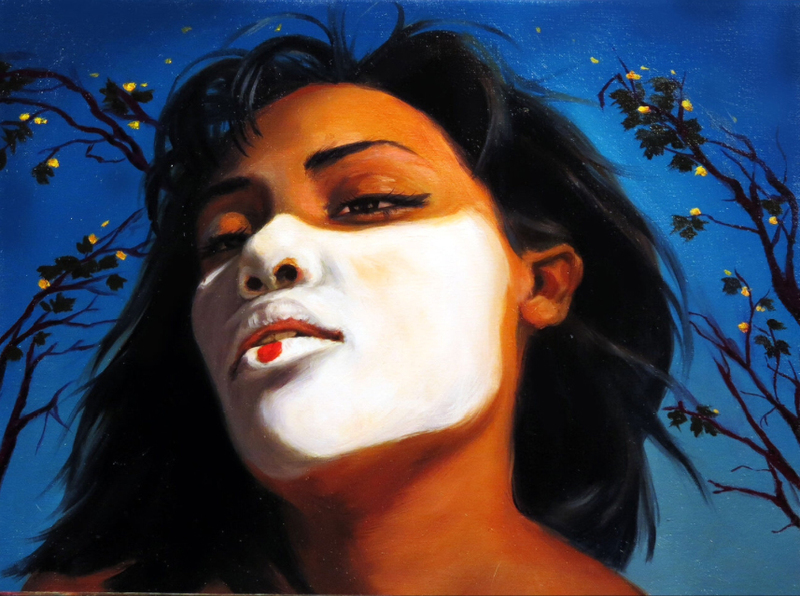 TW: This painting explores beauty and adornment. Different cultures have played with painting the face white and the lips red from Japanese geishas to French aristocrats. Since beauty is subjective and there are no universal beauty ideals, I found it fascinating that this type of face painting seems to appeal to such a broad spectrum of tastes. TW: I am beginning a series of self-portraits exploring my newly discovered Afro-European heritage. JT: Thank you Tabitha for sharing your process. TW: Thank you for taking the time to get to know me, and my work. 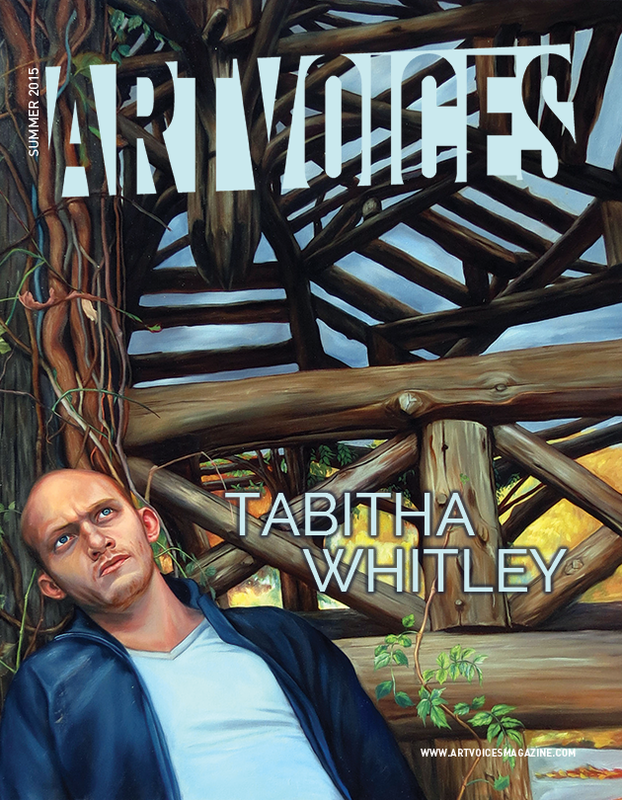 This entry was posted in Uncategorized and tagged Art, Artist Emergence, Artist Profiles, Artvoices Magazine, Jill Thayer Ph.D., Tabitha Whitley. Bookmark the permalink.